sandwiches – What's Cookin' @ Special Collections?! This week, rather than profile a single woman, I pulled some of the earliest cocktail books/books with cocktail recipes that we have in our collection that were written by women. In one of these cases, we didn’t originally even know the author’s name, but all three of these books give us a little insight into women and cocktails before the end of Prohibition. Beverages and Sandwiches for Your Husband’s Friends, front cover. Mrs. Bradley’s book is relatively short, only covering some basic communal drinks (aka punches) and a few “well-knowns.” It’s only a couple of years after Harriet de Salis’ 1891 Drinks a la Mode, and it doesn’t have quite that variety, but drinks of course, were not Mrs. Bradley’s only goal. Hers was more a book on entertaining groups of men, and as a result, she relies more heavily on the classics or things easy to produce en masse, as it were. Still, it does have a fin-de-siécle (Or “turn of the century”) flair, as the half title page above suggests. “Fin-de-siécle” was also a term that referred the closing of the century in Victorian culture, a time in which the “New Woman” feminist movement emerged. This new feminism influence social, literary and cultural, and political history into the 20th century. Given the time period, we might wonder if there was a little of the “New Woman” in Mrs. Bradley, as she bravely entered the largely-male-dominated field of cocktails and boldly declared her audience of like-minded ladies. In 1904, May E. Southworth complied a book called One Hundred & One Beverages. Our copy, below, is the 1906 revised edition. She collected popular cocktail and cocktail-adjacent recipes of the time, largely with an eye toward summer, though there are some hot drinks, too. Compiled, of course, is a key word here. Southworth didn’t, in as far as we know, make up any of these drinks, but she did bring them to a new audience of readers and tasters. Many of her choices are drinks we don’t hear about today (the Beaufort or the Barbed Wire, for example), but if you ask me, some of them might just need a revival. Southworth is surprisingly brand-specific, even when talking about ginger ale, cider, or carbonated water, which isn’t something that was very common yet. Whether it’s commitment or actual corporate sponsorship, we can’t know for sure, but it was a growing practice in the cocktail and cookbook world. Lastly, we’ll take a quick hop across the pond. Prohibition is one of my favorite periods in cocktail culture history. It didn’t do what it intended and it definitely had some unexpected consequences, including a lot of publishing about cocktails abroad. Mary Woodman’s 1928 Cocktails, Ices, Sundaes, Jellies & American Drinks: How to Make Them is quite an eclectic title. With the contents to match. Even if it wasn’t obvious, women were helping spread the word of cocktails from early on. They knew, as well as anyone, that cocktail were finding a place by the plate at a party or a quiet night at home, and they took on the challenge of incorporating them into their cookbook or tackling them on separately. And I know I can raise my glass to that. Cheers! I don’t know why summer always has me thinking and blogging about sandwiches. Apparently, it’s also a time we acquire materials on sandwiches (we’ll have plenty more bread-and-filling-based publications to share down the road). 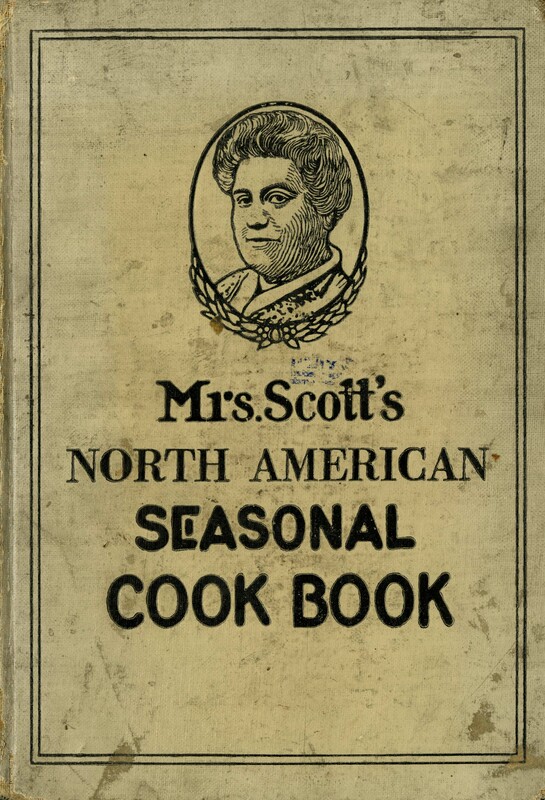 Today, I found one from 1924, Mrs. Scott’s Sandwich Book: Selected Recipes for Pleasing Appetizing Meals and Light Summer Lunches. Fitting, right? This publication is actually a supplement to a newspaper, The North American. They [sandwiches] are made of meat, cheese, eggs, vegetables, salads, fish, dried fruits, nuts, jellies, preserves–of practically everything. And there are hot sandwiches–How good they are!–as well as cold ones. 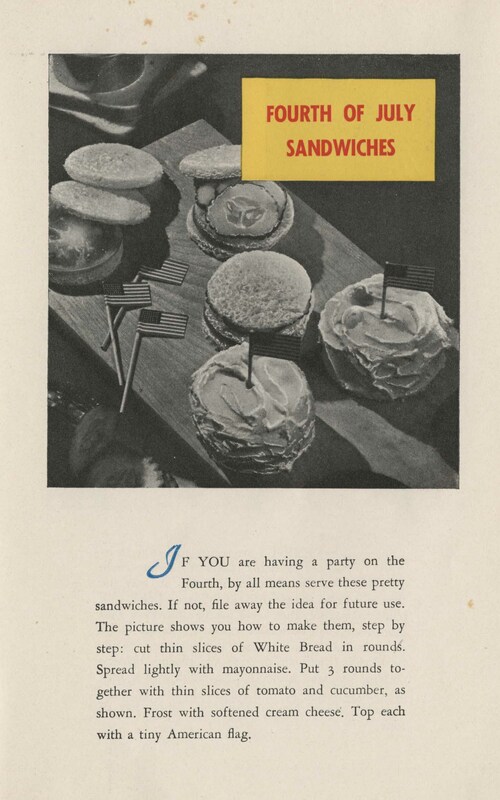 Indeed, this might almost be called the age of sandwiches…Along with the change in the nature of the sandwich has come a decided change in its use. once it was though of merely as a dinner bucket or picnic attribute. Now sandwiches are served at every sort of meal, except formal dinners, and even in the most fashionable of hotels and restaurants they are constantly in demand. Most pages of the fold-out are themed recipes around an ingredient or set of ingredients, many with small advertisements. Sections include: Assorted Sandwiches, Sandwiches Made of Olives, Cheese Sandwiches, Some Sweet Sandwiches, Dainty Salad Sandwiches, Pleasing Nut Sandwiches, Special Egg Sandwiches, Many Cheese Sandwiches, Selected Hot Sandwiches, Choice Meat Sandwiches, Canned Fish. You may be alternatively fascinated and slightly confused by some of the options, but there are quite a few tasty options, especially if you like cream cheese, olives, or pickles. 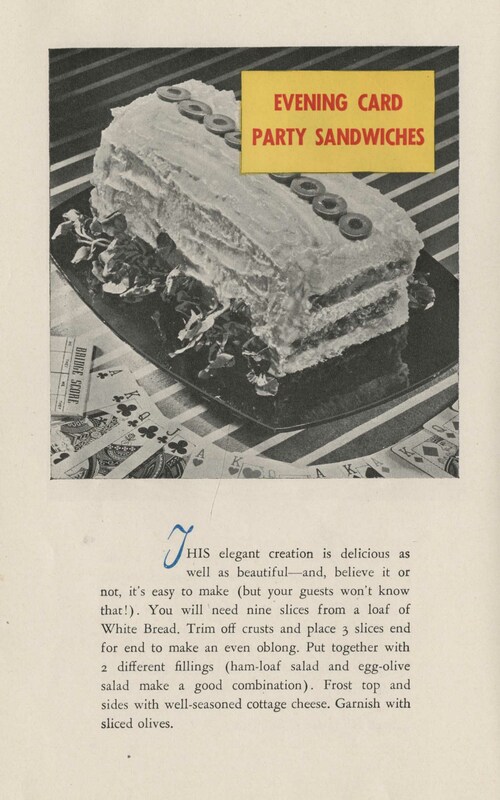 There is, of course, a recipe for our old favorite, the lettuce sandwich. And there’s a more fancy tomato and lettuce version or lettuce and cream cheese. If you’d like to pair your lettuce with something a little more unique, you could try peanut butter, dried sausage, or Spanish onion. If you’re a fan of condiments (sweet or savory), there are sandwiches that cater to you, too! Try a Tartar, Jelly, or Brown Sugar Sandwich. The few remaining pages are full-page ads: one for Supplee Ice Cream and one for Mrs. Schorer’s Pic-o-naise and Olive-niase. Yes, you read that right. The latter is pretty obvious, but I wasn’t able to find an ingredient list for the Pic-o-naise. 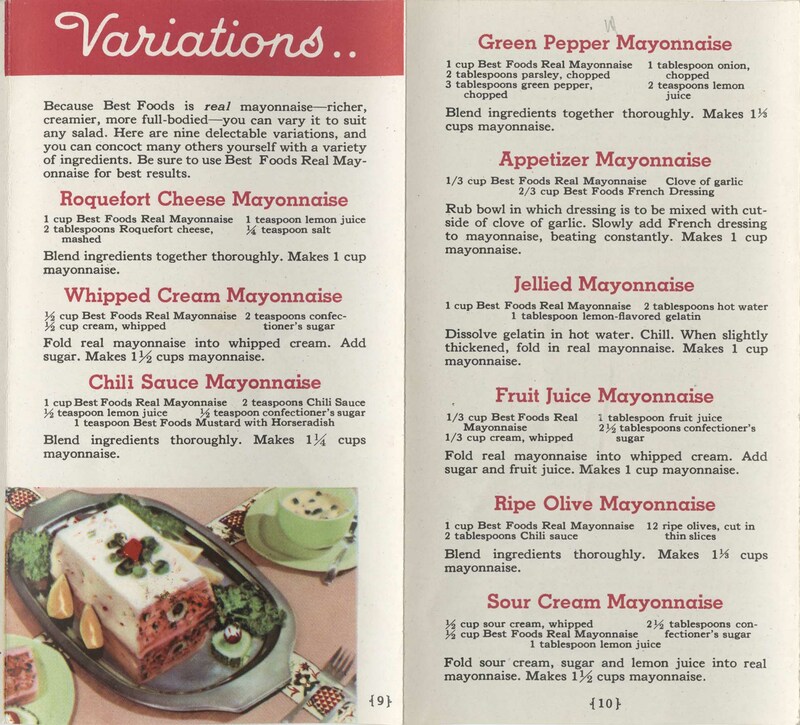 If I had to guess, based on the picture, I’d go with mayo mixed with pimento and olive or pickle (definitely something green and minced). We have a pamphlets for Supplee milk and Mrs. Schlorer’s products elsewhere among the culinary materials, too. 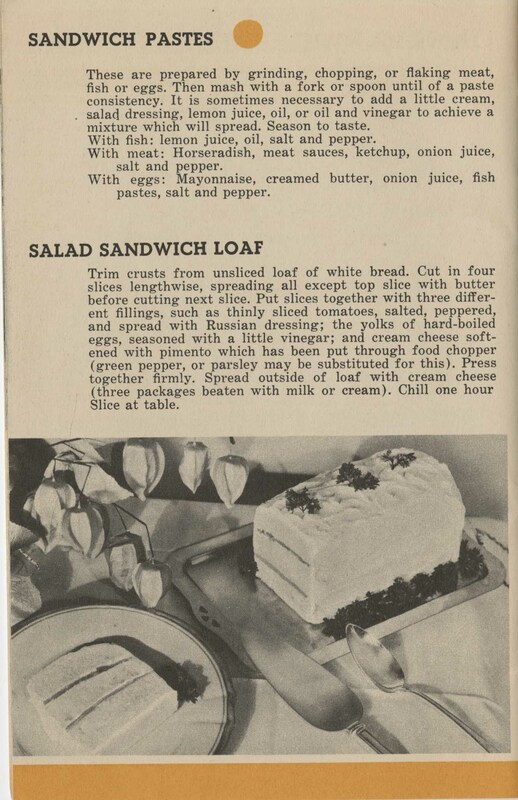 Anyway, for a 16-page supplement, Mrs. Scott’s Sandwich Book has a lot to tell us about sandwiches of the time. 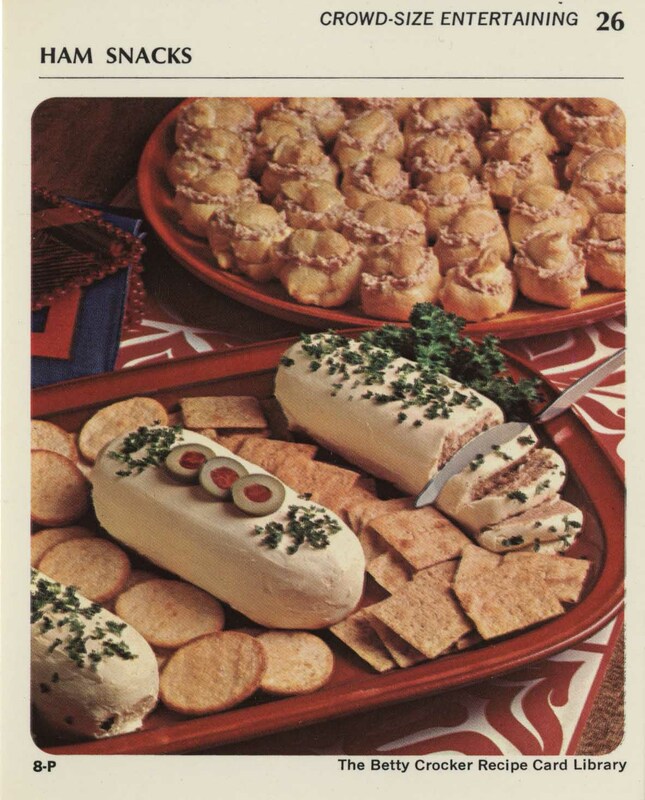 And hopefully you’re feeling inspired for your next picnic! These days, it might just be easier to send tomato slices in tupperware, if you’re worried about bread getting soggy! This publication is corporate sponsored (Town Talk Bread, Worcester Baking Company, Massachusetts). But, unlike some similar items, it’s far less obvious. This is a booklet that’s all about the recipes. And the sandwiches. (Sooooo many fillings!) 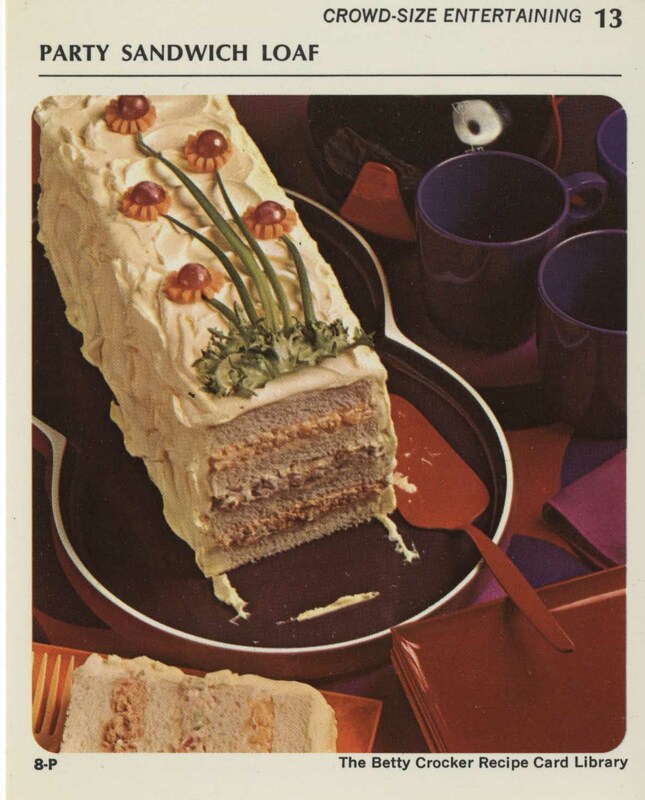 We haven’t digitized the entire item, but you’ll find recipes for themed parties, social events, everyday situations, picnics, holidays, and more. If you want to get ahead of the game, you can already start planning to use those Thanksgiving leftovers! At any rate, this great little publication is an important reminder: sandwiches are everywhere and you don’t need an excuse to enjoy them. Just grab your favorite bread and fillings and dive in. Stick with an old stand-by, or get creative–you might surprise yourself! Have a favorite sandwich? Let us know in the comments below!